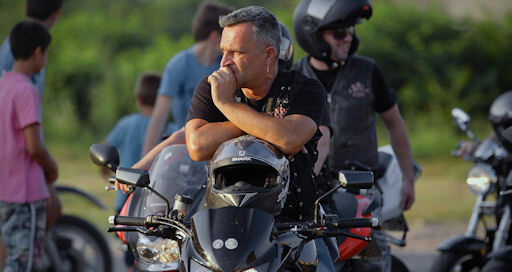 Review: Among Wolves / It's Just Movies Review: "Among Wolves"
A motorcycle gang of traumatized war veterans rides into town. They are acting out with bike acrobatics, looking tough as nails, taking no guff. Then they are listening to the nun at the local orphanage telling them what to do about the malfunctioning wiring. There are plenty of orphans here, for this is Bosnia Herzegovina, the site of one of the most brutal wars in modern history. The members of the gang are war veterans, to the man. In the context of the largest genocide since the Holocaust, these men fought against superior forces to protect their villages as best they could. Many of them died in the hills where they now ride their bikes. Wondering why they survived when so many other perished for no perceptible reason, they have little except each other. When they are not rebuilding homes or repairing things that would have been discarded 10 years ago in healthier economies, they watch after the wild horses. These horses run free along what were once the front lines of battle. They, too, are persecuted. They are shot and killed for sport, they stumble onto abandoned land mines and are dismembered. They are so simple they have no fear of man, yet they have leadership, loyalty and self-sufficiency. 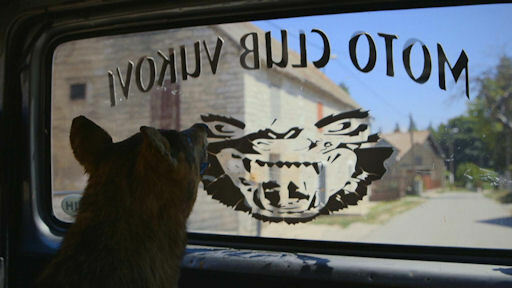 Lija, the elected president of the Wolves motorcycle club, carried his first rifle into combat before he was eighteen. At the age if twenty he was the leader of a disciplined paramilitary unit matching his superior knowledge of the hills of his home against the overpowering weaponry of a world-power backed enemy. The most amazing thing about the people in this mesmerizing documentary is that they are exactly like us. War has affected them the same way it affects us. This microcosm has adapted, slowly and not entirely, but it is surviving where others have perished. Lija wonders why people cannot be more like the horses he and his fellows protect. The movie follows Lija and other Wolves as they visit old battle fields, remember victories, defeats and, of course, deaths that came all too early. Like veterans around the world they will spend the rest of their lives trying to rationalize the perfectly irrational. They can never forget, but they can cope. Sitting on the old tanks, planes and machine guns, now museum pieces, seems to ground them. We are steadied at the same time, realizing that these are only earthly artifacts, not demons from hell. They argue, yell and threaten each other, but they stick together. At their annual Livno rally, Lija directs his opening address to three members, telling them to shape up or they will be kicked out. One bad actor will not be served drinks, or Lija will beat him, and whoever serves him as well. The trick is to keep the discipline of the military, and the discipline of the horses, without the killing. A tough act, but day in and day out, they seem to be doing it.